Since the convention’s opening on Friday, attendees have received thrilling new looks at Marvel’s world-shaking WAR OF THE REALMS series, written by Jason Aaron and drawn by Young Gun Russell Dauterman; the deadly ABSOLUTE CARNAGEevent, written by Donny Cates and drawn by Ryan Stegman; and the next monumental chapter for the X-Men with HOUSE OF X and POWERS OF X, written by Jonathan Hickman and drawn by Young Gun Pepe Larraz and R.B. Silva respectively. 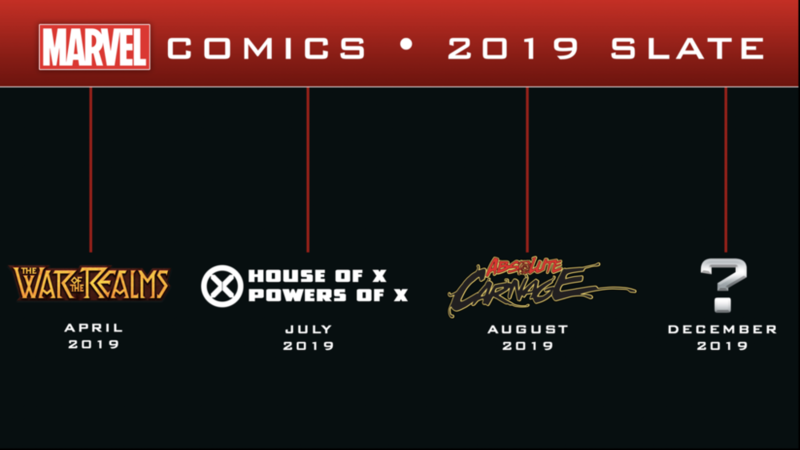 More details on Marvel’s 2019 Publishing Slate will be revealed in the coming weeks so stay tuned to Constantcollectible.com. In the meantime Let us know in the comment section below. Also, Don’t forget to like, share and subscribe to all things Constant Collectible to keep up to date with all the news and reviews from a world of GEEK CULTURE.